Elise McSweeny is a creative entrepreneur and co-founder of Australia’s most successful yoga brand, Power Living Australia Yoga. She has spent most of her working life within the entrepreneurial sphere, gaining her sage-like wisdom through her continuous desire to learn, and powerful life experiences. On the latest episode of Bond Appetit, we had a candid talk about all kinds of aspects within her business. Here I wanted to touch on how she has finally come to terms with her successes, and her perceptions around identifying as an entrepreneur. Recognising your achievements as a business owner can be tough, particularly if you feel like your goals aren’t fulfilled. “There’s sets of standards by which we measure our own success,” Elise told me, a sentiment that I think numerous entrepreneurs could identify with. Many see that if we’re not reaching the heightened level of achievement that we have set ourselves, then we tend to consider that a failing. Even though Elise owned one of the most popular and successful bars in Manly, New South Wales – she struggled to see where she was succeeding. Beneath the surface there was the threat of bankruptcy and divorce, so in order to be perceived as successful, she put on a brave face. “You have to put on a façade.” This façade meant that she wasn’t admitting setbacks to dictate her path, rather to use what was positive to define what the future will hold. In hindsight, she now has the experience to realise that it is all a matter of perspective, and that we all tune in differently to what makes us successful. You need to establish how high your success bar sits, and acknowledge and appreciate your achievements when you hit them. Remember, even turning up and being present every day is a success in itself. 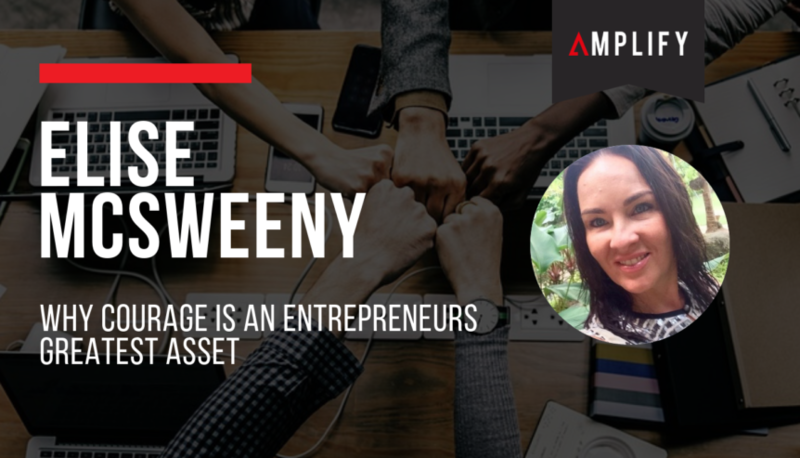 I asked Elise whether she thinks she was born an entrepreneur, to which she replied, “I don’t think anyone is born anything.” She sees in herself some strong character traits which have ultimately laid down the foundations for her entrepreneurial prowess. It’s true, and I think we can all agree it takes a huge amount of courage to start a business venture. Mustering up the courage to not conform, the courage to face adversity and navigate through successes and setbacks. Taking on the challenge, and having no clear idea of the outcome, that takes a level of daring and bravery that only an entrepreneur will experience. Whether you’re a business owner or taking on a new venture, it takes a huge amount of courage. This is something that you should recognise and cherish as you move on along your path. My sliver of advice, and I think Elise would agree with me, is to celebrate and see all your successes as they occur.